You could also click the Purchase Orders icon on the Home screen, or click the New Transactions area of the Vendor Center and then select Purchase Orders. You see the Create Purchase Orders window. Note that the exact details of this window depend on how you customize your PO form. Choose a vendor from the Vendor drop-down list. Click the down arrow to see a list of your vendors. Click a vendor to see its name and address in the Vendor box. If you can’t find the name of the vendor on your list, click Add New from the list and then fill in the information about the vendor in the resulting New Vendor dialog box. Click OK when you’re done with the dialog box. If you track your inventory by class, select a class from the Class drop-down list. The Create Purchase Orders window may not have a Class drop-down list. If it doesn’t and you want it to have one, you have to set up QuickBooks to track expenses by Class. To do so, open the QuickBooks file in single-user mode as the administrator. Then choose Edit→Preferences and click the Accounting icon in the list on the left. Finally, select the Use Class Tracking check box and then click OK.
(Optional) Select a Rep, an Expected Date, and a FOB if you’re using them on your PO. You may have to fill in other fields before you get to the item-by-item descriptions at the bottom. Again, these fields may not appear if you haven’t indicated that you want them on your form. Move to the Item column and start entering the items you’re ordering. Entering the items is the most important part of creating a PO. When you move into the Item column, it turns into a drop-down list. Click its down arrow to see the Item list. You may need to scroll to the item that you want to enter. A fast way to scroll to the item is to type the first few letters of the item name. If you type the name of an item that isn’t on the Item list, QuickBooks asks whether you want to set up this item. If so, click Set Up and then fill in the New Item dialog box. Enter as many items as you want in the Item column. QuickBooks fills in an item description for you, but you can edit whatever it puts into the Description column, if need be. In the Qty column, indicate how many of each item you need. If you change the item cost, QuickBooks displays the Item’s Cost Changed dialog box, which asks if you want to update the item information for the new cost and also whether the item’s standard price should be adjusted up or down. Select Yes and No and then click the OK button to make your decision. If you want to, fill in the Vendor Message field — but definitely fill in the Memo field. No matter what you do, be sure to fill in the Memo field. What you write in this field appears in the Open Purchase Orders dialog box, and this info is the surest way for you to identify what this PO is for. Write something meaningful that you can understand two weeks, three weeks, or a month from now when you pay for the items that you’re ordering. At the top of the Create Purchase Orders window is the Print Later check box, which tells you whether you want to print this PO. If you want to print the PO, make sure that this check box is selected. After you print the PO, the check mark disappears from the box. Click Print to print the PO. If this PO is one of many that you’ve been filling out and you want to print several at once, click the arrow beneath the Print button and select Batch from the drop-down list. Before you print the PO, however, you may want to click the down arrow beneath the Print button and select Preview to see what the PO will look like when you print it. You use the History button after you receive the items you’ve so carefully listed on the PO. After you receive the items and record their receipt, clicking this button tells QuickBooks to give you the entire history of an item — when you ordered it and when you received it. Click Save & New or Save & Close to record the PO. 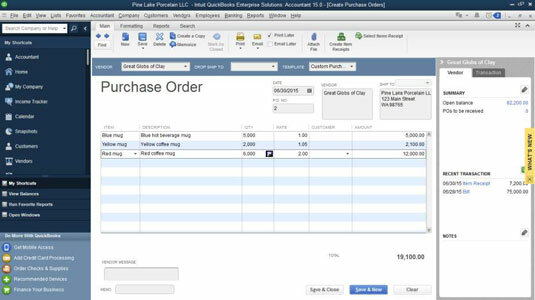 QuickBooks saves the PO and displays a new, blank PO window in which you can enter another order.